Can’t wait for things to green up? 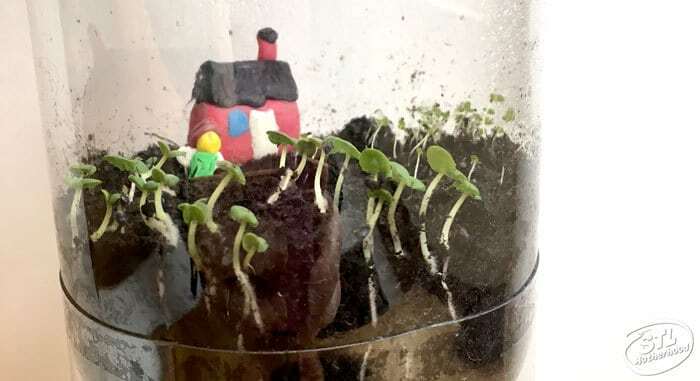 Give it a jump start by sprouting some seeds indoors! You can plant seeds as a little science experiment, or just for the fun of watching your creation grow! Either way, your kid will love to care for a cute garden of their own. 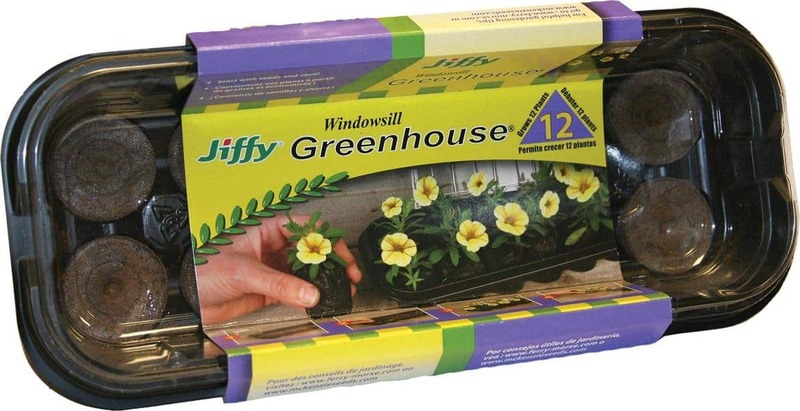 When Mitch was little we spotted these super cute window sill garden kits at Walmart and couldn’t resist! The kits are super simple–just add water to a dry disk of dirt like substance and vola! Your pot is ready for a seed. Mitch was convinced he was actually growing wheat for the sheep to eat. It’s a Minecraft thing. I haven’t seen planters like the adorable lamb head at the store this year, so I looked to Amazon for new ideas! I found this really cute Fairy Garden kit that comes with little fairy figurines and their bug friends. 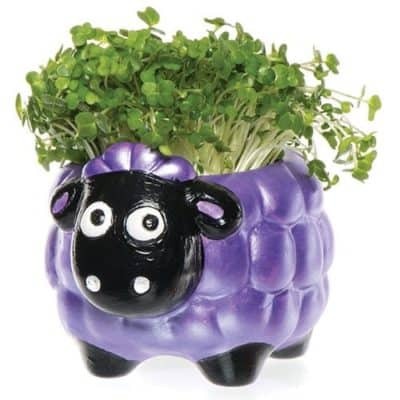 This fluffy sheep planter is a good substitute for the one Mitch had–plus you get to paint it yourself! 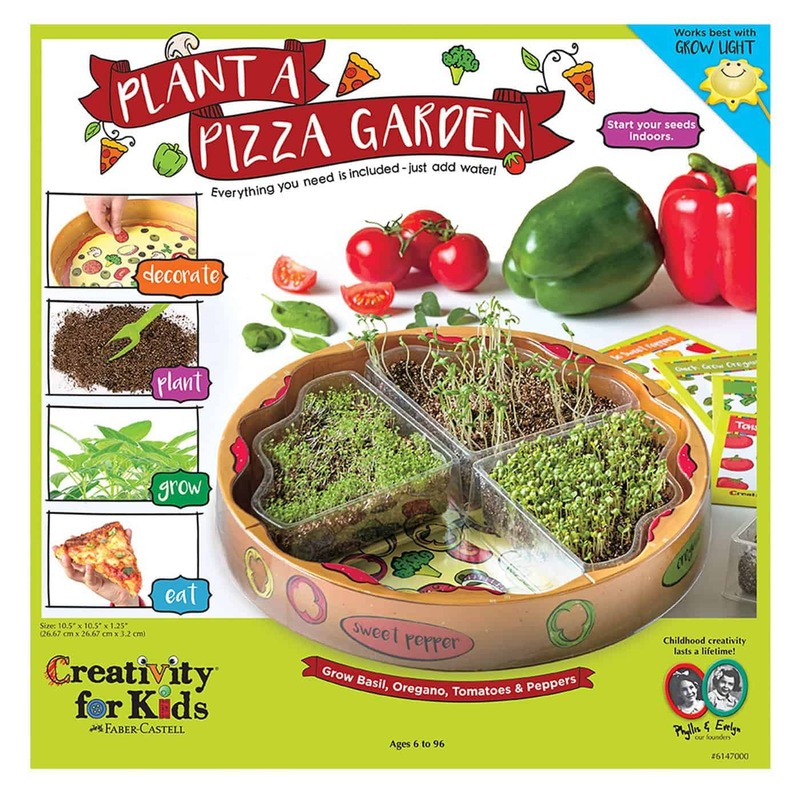 If you want a kid friendly garden project that’s a little more practical, then how about a pizza sized pizza garden? It’s about a foot wide, so it may not fit on your windowsill…but I’m sure you could find a spot for it on your patio! We tried growing flower seeds last year, but we weren’t able to get our plants strong enough to move into the real garden. They kinda croaked as soon as I got them outside. However, what we tried last year was a “grown up” seed starter. It was too large for my kitchen window sill and kind of a pain. (This one looks like it will fit on my sill, so we’ll try it!) 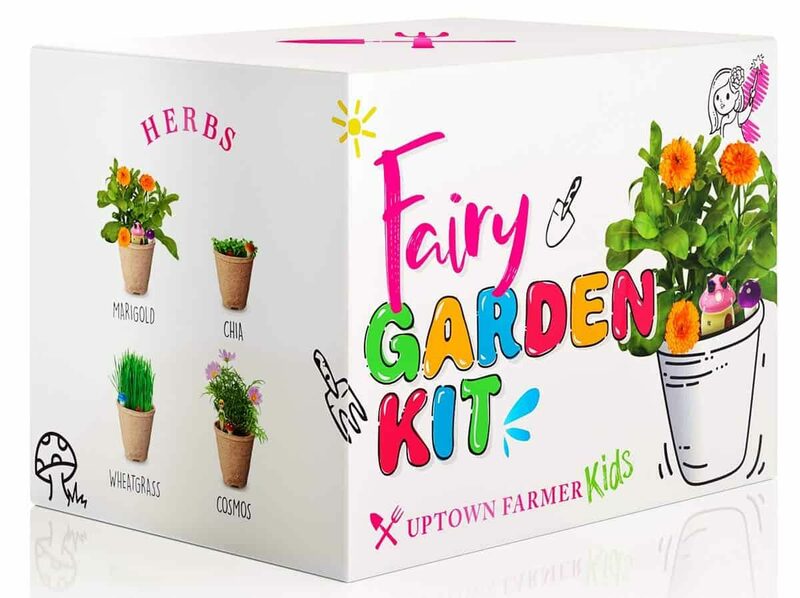 These cute little kid gardening sets are so small they can stay on the sill all spring and summer! 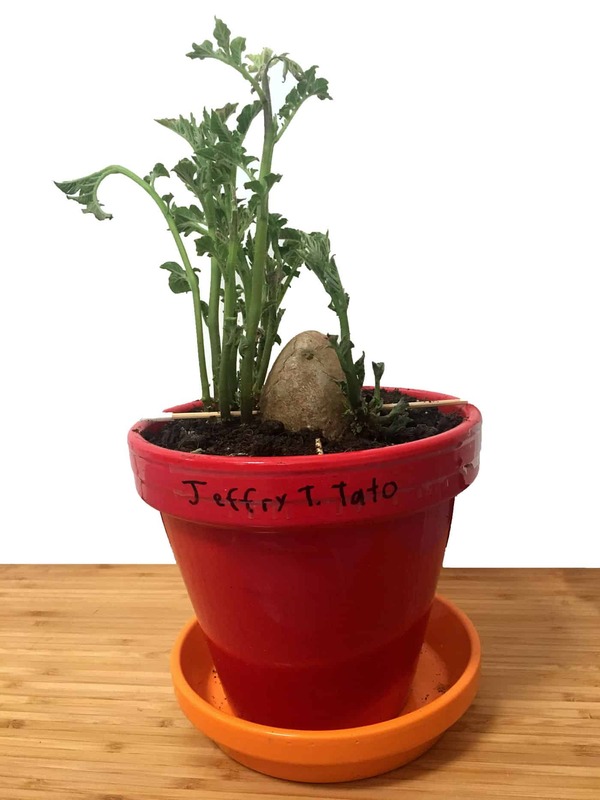 Right now Mitch is growing “Jeffry T. Tato” the potato. We found a potato in the back of the pantry that was starting to send out roots and Mitch decided that it NEEDED to grow. And he named it. Of course. If you want to grow a potato, start with one that’s got roots. If you have a messy pantry like mine, it won’t be hard to find one that escaped the bag… You’ll want to start it in WATER first. Stick the potato with toothpicks or skewers so that only half the potato is in the water. Put it on the window sill and let it go! 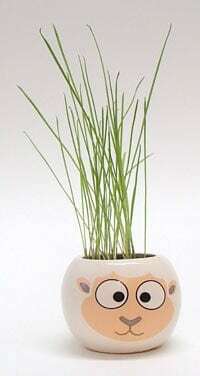 When it has a good set of new roots, transfer it to a planter with dirt. Theoretically, the potato can grow new edible potatoes…but we’ve never made it that far! I’ve heard that Sweet Potato make excellent vines! 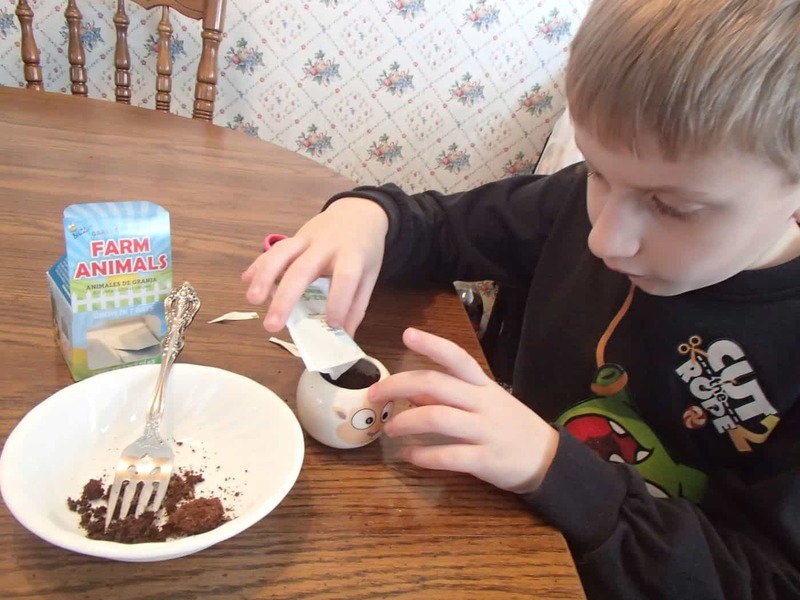 You can also experiment with seed sprouting in a plastic bag. 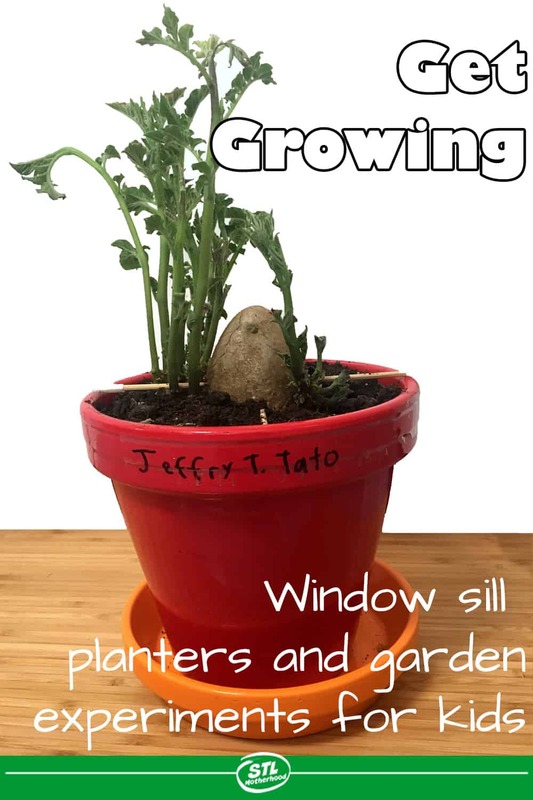 All you need is a sunny window, seeds, paper towels, a baggie and tape. You don’t even need a shelf or sill. The staples keep the seeds from sliding down the bag so you can watch the roots develop. Of course you can take your garden experiments up a notch by planting a whole ecosystem in a soda bottle! This was a really great experiment we did a couple summers ago.